* Found this post in draft on iPad – saved locally, so I completely forgot about it. Published on ANZAC Day, about Christmas Day. The celebration season has also finished. December these days just seems to be one lunch, dinner, drink, party, BBQ after another. I am not complaining at all. But it is exhausting and I was more than a little apprehensive about this holiday season and how I would cope with it all. And I’ve done all right. Of course. I get through. And I’ve had some lovely times. I really am blessed with the most caring, loving family and friends and this gets me through. Dad had quite a large operation just before Christmas and didn’t get out of hospital until 17 December so mum and dad decided to have a quiet Christmas and we celebrated with them in Bowral on 18 December – together with Sarah, Chas, Ben, Sophie and Mike, Tim and Georgie, Max and Max’ parents, Vlad and Jana. It was a lovely lunch. I think we were all a little trepidatious but we did all exchange presents and eat! We all got up around 8ish and exchanged presents. I got some really thoughtful presents -a lovely fox bag, a lantern, music, two cake plates, books, cook books. Carl and I then asked Jack and Isabel to come on a walk and scatter Daisy’s ashes. Daisy dog died over 6 years ago and we have had her ashes since then in an urn. 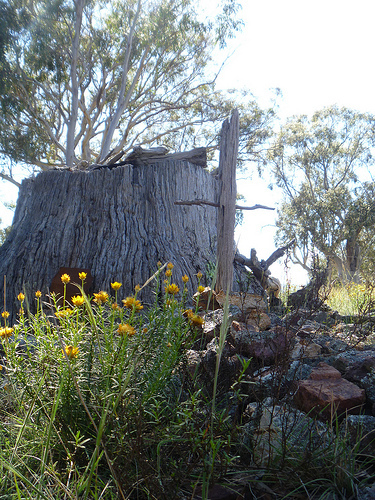 We had always intended to scatter her ashes up on a ridge between Mt Ainslie and Mt Majura where everlasting daisies flower. The walk took almost two hours all up – and we all shared in scattering her ashes. It was really quite a lovely thing to do. Lovely just to be the four of us and the dogs and Daisy. W got home and had a late breakfast around 11, an even later lunch around 3ish and then at 6pm we went to Carl’s brother Paul’s place for Christmas pudding and dessert wines, muscat and port. So possibly not your average Christmas day in some ways, but then again, what is an average Christmas day? At the top of the ridge where we scattered Daisy's ashes.